Continued from yesterday’s post, Relaxed and Not So Batty – Part 1. We had arrived. Since becoming parents in 2001, Scott and I finally got the go-ahead to make reservations for our first weekend away in ten years — no kids. My brave generous brother graciously offered to host all four of our kids for the weekend, just so we could relax and enjoy an adult weekend together, whatever we wanted to do. Right on cue — at the 11th hour no less — our youngest came down with the croup. Bags already packed, giddy with the thought of waking up to no one else in our beds, we reluctantly canceled the anticipated weekend off. The companion super-high fever coupled with a potential for airway blockage (signature of the ‘croup’) required 24/7 monitoring, hopefully not resulting trip to the ER like the last time it hit. This summer is now a year later and the babysitting stars aligned once again. As luck would have it, both sets of grandparents agreed for a split — boys with one, girls with another — yet neither of us had any inkling as to what we could do for those four days. We hurriedly began looking into local hotels near the drop-off point in San Antonio. Question: What does one do in the late summer and 100-degree temps of central Texas that doesn’t involve crowds of kids or otherwise loads of people and touristy attractions? Caves are cool, even when it’s hot. The humidity and temperature 180 feet down is a comfy 70 degrees. We are lovers of hiking, particularly when there’s elevation involved. Natural Bridge Caverns was in the immediate vicinity. Getting dirty and right up in nature’s business is just my thing. Stay on the Trail! That first step is a lu-lu. The “Natural Bridge” for which the cavern is named. My cousin, Elaine, over at American RV Life could not have timed her post on bat watching in central Texas at a better time! Oh wait…there was another as well. Is it possible she was giving me a poke-poke-nudge-nudge? I guessed it was. So in usual chit-chatty form, I called her. “The Bat Lady,” as she’s lovingly known, was involved with Bat Conservation International (BatCon) in her past and has an affinity for these awesome creatures. She is to bats what perhaps I am to bugs. August, she urged me, is the perfect time to bat-watch; pups are just starting to fly, learning to hunt with their mothers. Bracken Cave is a renown nursery and migratory home to millions of bats annually and just recently opened for public tours — just the thing for a romantic weekend getaway. How convenient, too! It’s right smack dab in the middle of the Natural Bridge Caverns area where we were already planning to go. Up until recently, only BatCon people have been allowed to witness the nightly flight of millions of Mexican free-tailed bats. The largest single colony of bats in Texas — in the world — it’s simply a must-see while we can. BatCon owns the property including the cave and recently opened it for public tours to raise both money and awareness for a condition known as White Nose Syndrome (WNS) that is decimating bat populations nationwide. Mexican Free-tailed bat. Cute, isn’t he? Don’t even get me started on mosquitoes and other biting flies. White Nose Syndrome — caused by and named for the fungus that results in a powdery residue on their noses — is killing bats at an alarming rate. It is believed that it awakens bats from their hibernation early, causing them to starve to death. Alarming isn’t a strong enough word, I’m afraid. We’re talking declines of 80% in some colonies. The science community is only still learning about this disease, what caused it, and how serious the devastation on bat colonies really is. They do know that the bats’ decline is comparable only to the recent demise (a/k/a/ extinction) of the passenger pigeons at the turn of the last century. Bats are intricately entwined in our working ecosystem. It is a serious cause and like many other alarm bells going off around the world, Homo Sapiens needs to quit hitting the snooze button. In naturalist and conservationist fashion, we promptly made hotel reservations in New Braunfels on the river and secured tickets to the cave tours on-line. And we cross our fingers that nothing else would arise to squash our plans. The river spot in New Braunfels was just what we needed. There were only 14 rooms at the inn and no kids under 13 allowed. Perfect. This made for a quiet relaxing spot no matter where we decided to park our booties. Wine on the balcony, Scrabble in the dining room, lounging by the river, or a short walk into the historic district for people watching. Lots of hand-holding and snuggling. We slept in every morning, and the inn-keeper kept the dining room stocked with homemade chocolate and carrot cakes which we couldn’t resist sampling. Several times a day. We toured the caves and at dusk, witnessed the splendor of the Bracken Bat Flight. Photos and video really do not do it justice, though I hope you enjoy. It is an experience that is best enjoyed in person. Next time, I hope to be more prepared for low-light conditions and bring the tripod and cable release. Scott in awe of the sight of millions of emerging bats and pups. It was described to me as a tornado emerging from within a small hole in the ground. Tens of thousands of bats, all flying in a singular circular direction, working toward the entrance, then swirling off with smaller groups to spend the night in search of food. It was challenging to get a photo perspective; ‘tornado’ definitely works for description. At one point, it felt as if they were all swirling around my head, instinctively making me put an arm to my face in reactionary defense. Bats just kept coming and coming and coming. The emergence — lasting well over an hour — didn’t seem to have an end to it. We left before it was finished. And you know what? Not a single one got stuck in my hair. Bats are fascinating. We finally made it to Carlsbad Caverns last year, where we got to see some, but were not allowed photography. I apologize for being presumptuous, but I am attaching a link to my post about the experience, in case you need some more reading material (in addition to all your fascinating bug books 🙂 ). The first time I saw bats fly like this was at Carlsbad, many years ago. It started my fascination with the creatures, and even though I’m still not fond of being buzzed by one, I’ve pretty much lost my fear of them. I still remember the night I was watching them emerge from the cave on radar, and noticed something else strange: it was the initial smoke plume from the Bastrop fire. I’ve never been to the sites you visited, even though I visit Kerrville regularly. I need to put that on the list. Sometimes, the places that are most convenient don’t get visited. Another example? The Johnson Space Center. I can see top of the buildings from my computer, but have I been there? Uh… no. Haven’t been to Carlsbad in nearly two decades. It’s on our list of go-to’s with the kiddos though! Texas is amazing for it’s nature gems, many right in our own backyards (JSC in yours, Brazos Bend in mine). That plume visual puts your sighting in 2011? For the big, BIG fires during our prolonged drought? Thanks for your lovely comments, Linda. See you soon! I never look at the WordPress reader, but today I did, and I realized that I’ve missed a couple of posts because the emails didn’t arrive. Not only that, your previous post isn’t even in my Reader. I just took another look to be sure, and it isn’t there. So, now you know about that, and now I know about your posts, and can go back and have a read! Hey Linda…thanks so much for the feedback. I love reading via the Reader because the pocket computer frees me to read while out by the creek with the birds (where I am now). This post was created back in 2012, as was Part 1, so it’s really for those who use the WP Reader. My time to write new content (even to read blogs) is still filled with other necessary summer things, so re-blogs like this is akin to throwing you a bone. Got five years worth of stuff here! Easier to just regurgitate. The last one to arrive via email was ‘I Love It…’ If you didn’t get that one, I’m not sure what happened. Hope you’re having a cool summer! How did I know you’d like this, Jet? Oh…I guess it’s because we have a similar love of nature’s wildness. You would love Bracken Cave in Texas. BatCon extended their public tours because it is such an amazing place to advocate and educate for the conservation of bats. If you ever make it here, be sure to put it on your bucket list. You will not be disappointed. My cousin is awesome in so many ways. Alas, my family is seriously lacking in the environmental and animal-loving department. I’m afraid it’s only Elaine and me! PS — We watched as a half-million swallows came in to roost last night. Working on a post on it!! Was superb and very similar to the bat ‘tornado.’ Only we got crapped on a lot. There’s a large population just an exit up the highway from our exit that has it’s own mass exodus each evening. It is the most fun plume of black “smoke.” Like how smoke looks in a Don Bluth film. I somehow missed your comment over the years, coming back and revisiting this post now. Say…did you ever build and erect a bat box somewhere on your (new) property? We are seriously considering one for ours. I hope you and the family get over to the Natural Bridge Caverns one evening to witness this exodus in person. It’s worth the money spent. Happy Summering, A! Oh, why, yes I do. But my days of To-Do list-ticking are right before me now! In time…sweet, sweet, time. Love the photos. Your bats look much creepier than my few birds! I’m not sure how I would have reacted. When I was a girl (maybe 8 or 10ish), my family lived in a house where bats would fly around the upstairs bedrooms while we tried to sleep. I remember my sisters and I hiding beneath the blankets screaming until Dad came up and took care of them! One or two were plenty for me. That is freaky indeed! Thanks for sharing. I don’t know if I’d like flying rodents any more than walking rodents wherever I’m sleeping. What beautiful pictures! 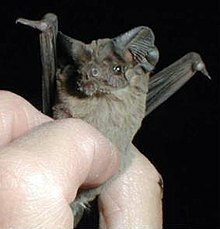 I was delighted to read that image was via Wikipedia and not via you actually holding a bat in your own, little fingers. Yipes! We have 2-3 little fruit bats that have selected the corner of our office building, 1 foot from our front door as their daytime sleeping place. They somehow think this is a cave. If we don’t bother them, they don’t bother us. Oh, Peg, how is it that you got caught in my spam filters? Crazy! You have been released. I have a great photo of my husband after catching a bat that had happened through our apartment in Malaysia. We used a bed sheet (threw over him) and then relocated him outside where he posed for a photo, caught his breath, and then flew off. Fun! We just purchased plans for a bat house. We plan on building 2-3 the next weekend and placing in our canopy out back. Cross your fingers! I am not a bat, bug or anything crawly or even nearly creepy – kind of girl…but, this, this was awesome. Glad you got away! Hope all is well with the coughing kiddo. Thanks, Jess! I hope that at least you walked away with some new knowledge and respect for the furry little guys. Having just returned from the North American Scrabble Championship in Reno, I can definitely appreciate fellow point-makers! We’ll have to get a game together online one of these days. I really hope you do! Brazos Bend gators are cool, yes, but this…you need to go there. Totally worth the $$…you’ll want to give more. What a cool getaway. Bats! 200 tons of insects a night, wow. Sounds like a sublime weekend. The only thing that would have made it better was if they’d have let me hike down to the mouth of the cave to watch it. I highly recommend that you take a trip just to see it if you can. You need all senses (oh, the smell!) and peripheral vision to take it all in. That is really cool. I’m not big on things flying around me (at least that many things!) but I bet that was awesome to see. So glad you finally got to get away. We’ve only had a couple ourselves. Hope the next outing comes much more quickly. Yes, parents and kids separating every now-and-again is a good thing – for parents AND kids. It was spectacular. There were snakes (BIG snakes!) at the cave’s entrance waiting for their chance at dinner too. In the morning, I’m told the hawks hunt the entrance as they come back. That would something to see. I owe you a guano-load of gratitude, Elaine. I hope to take the kids to see it one day, if it’s still open. That’s my kind of vacation!